I have a slight obsession with the ease of printing off treat toppers, and stapling them onto a ziplock bag. 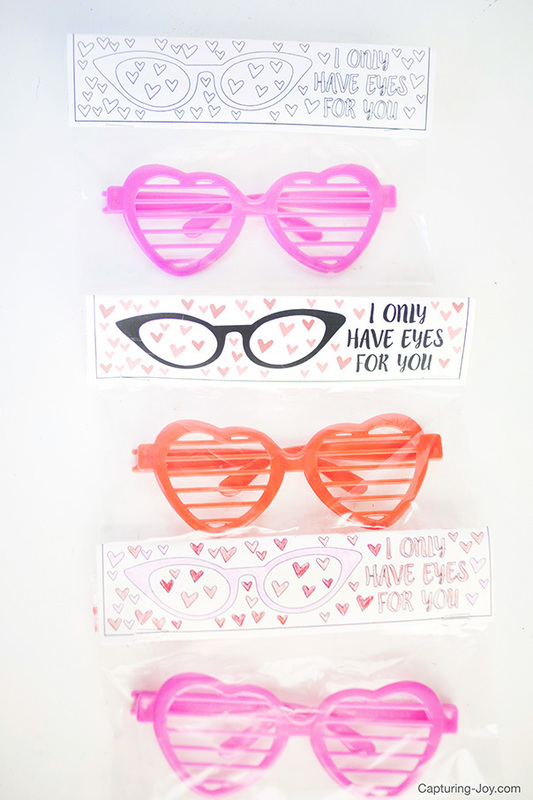 I like them for teacher gifts, holiday gifts, and now for Valentine’s. It’s pretty much the easiest way to gift something, with everything I already have at home. What you put on the inside is up to you, though I have ideas here for you today. I shared the color version of these treat toppers over at Cute Girls Hairstyles today, as I’ll be a guest on their site here and there. BUT I’ve got the “coloring page” version here today, and I love them just as much! 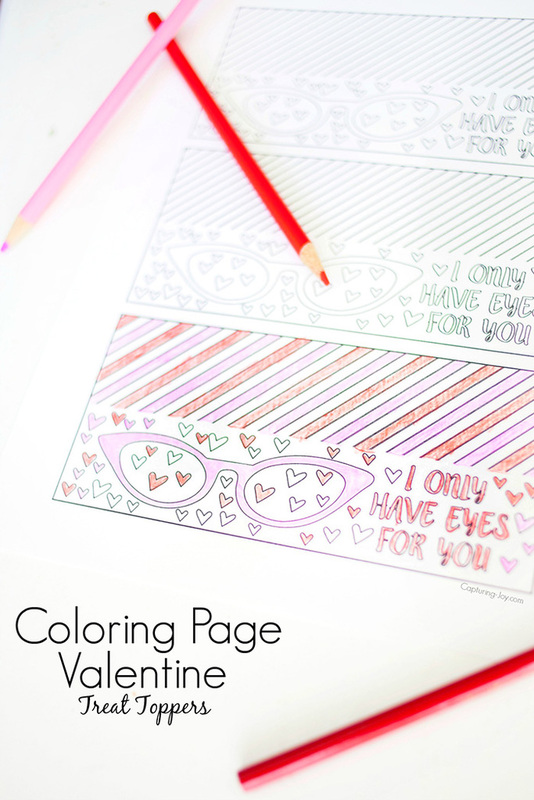 My girls love coloring, and this is a fun way for kids to craft and create Valentine’s for their friends at school. As I mentioned, you can put ANYTHING inside the bags, but I think it’s fun to coordinate with the message on the treat topper. Links to Amazon (affiliate), you can grab gummy worms (sour are brighter colors), plastic glasses, and popcorn (I added Valentine M&M’s and white chocolate) for the different toppers. I’m a BIG fan of treat toppers as gift ideas. All you need are a few basic tools that you already have around your house…exciting, right? 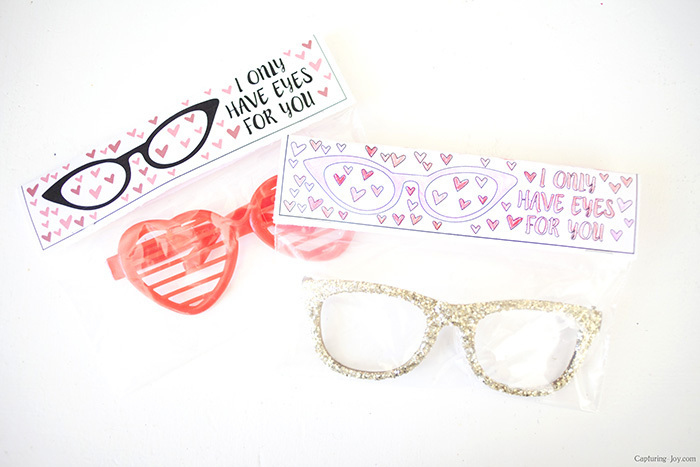 For the printable toppers, I prefer card stock paper, because it’s thicker, but you can also use standard printer paper. I buy a pack of card stock at my local craft store (aiming for the 50% off sale) and have that on hand for projects like this. 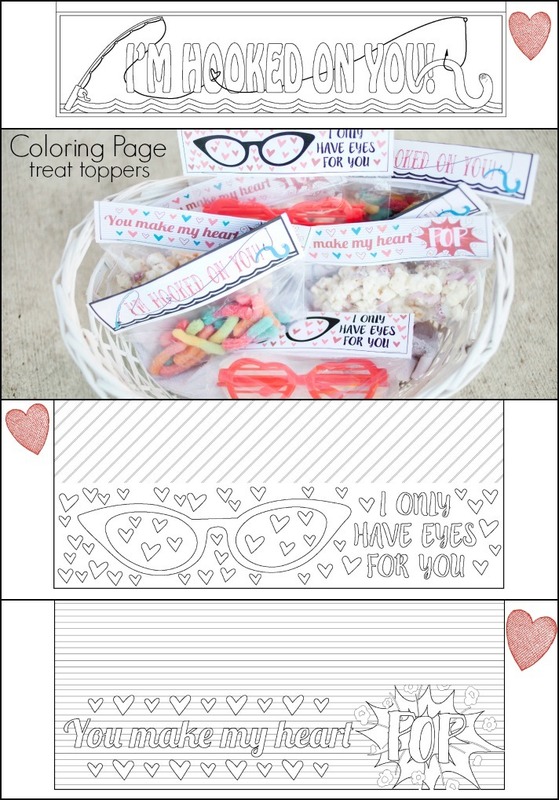 Below is a picture of the full color version, the black and white, and the colored in of the “eyes” Valentine.